A few months ago, my family and I traveled to Colorado Springs for a fun opportunity I’d been given — to record an interview with Focus on the Family about the value of praying for our girls. Anywho … today, that interview is live! You can listen here or, if you’d rather, watch it here. In the interview we spent some time discussing the content in chapter 11 of Praying for Girls: Asking God for the Things They Need Most. Jim loved the practical tips in that chapter about how we can renew our minds in the Word. You can download a beautiful PDF with 5 Tips for Soaking in the Word on the Focus website. Click on the image below to access that content. I loved writing this book and I’ve loved every single opportunity I’ve had to talk about why praying for our girls is so important. If you have a daughter, I encourage you to check out all the ongoing resources and support I have just for you! And be watching … because I’m working on even more!! Praying Scripture for our daughters is a gift we give to them … but, more and more, I’m discovering it’s a gift for me too. More often than not, the very prayers I’m uttering on her behalf are ones I need for my own heart and life as well. I hope you’ll take time to listen or watch this interview. 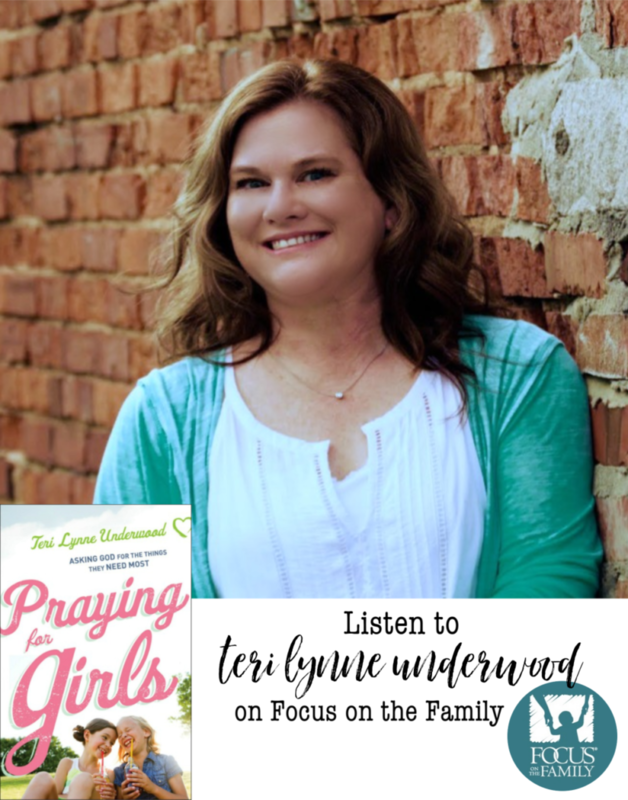 I’m honored to have been a guest of Focus on the Family — and if you make a donation to their ministry, they will give you a copy of Praying for Girls: Asking God for the Things They Need Most. Download 5 Ways to Soak in the Word here. Learn more about my ministry to girl moms here. Learn more about Praying for Girls: Asking God for the Things They Need Most here. I hope you have a great weekend! It’s supposed to be sunny here in north Alabama and I’m so thankful! April Prayer Calendar Now Available!